The challenge was to use a flexible facility (i.e. one that could be adapted to future input materials) to manufacture a variety of products so that the investment could continue to safeguard the future. The feed bunker contained electronic waste (WEEE). Today, almost two years later, the facility is being operated by STEINERT partner MWN in Lyss, Switzerland, where it produces the desired results. Hansueli Bühlmann is well-known for his innovative spirit. He is driven by the desire to find ways in which processing can be simplified so that it becomes “less laborious”, as he puts it. What is characteristic about him is that he plans investments well in advance and knows the market inside and out whenever he makes a purchase. He doesn’t want to have any residual fraction left over and he processes materials so extensively that every gram of it benefits his company. The goal is to have zero waste. “At the STEINERT Test Centre we were shown in detail what the machines can do. Moreover, we were impressed by the employees’ commitment,” says Bühlmann. His business is a family-run enterprise that has to set itself apart from the big companies. It does that by specializing in niche areas instead of mass materials. Hansueli Bühlmann is successful because he has the right timing, a good nose for innovations and a tight rein on his investment budget. “Whenever Bühlmann does something, you can be sure he has a clear objective in mind,” people from the sector say. And because Bühlmann is ahead of his time, he has no qualms about letting us into his facility. But why is a company from Switzerland so far ahead of everyone else? The answer is simple: Switzerland implemented the electronic waste directive (WEEE Directive 2012/19/EU) before the EU countries did. The extensive recycling of materials has always been a driving force for waste processors in Switzerland. This flexibility is mainly due to the STEINERT sensor sorting systems STEINERT KSS and UniSort Black. The former is equipped with colour, X-ray and metal sensors as well as with a laser-based 3D recognition system. The overlap of sensors and signals enables the system to perform a wide variety of sorting tasks. A touch panel allows users to select and preset several different programs in the controller. The second machine uses an HSI (hyper spectral imaging) NIR sensor to sort materials. This high-resolution camera technology even enables the machine to recognize black plastics, which are otherwise undetectable. 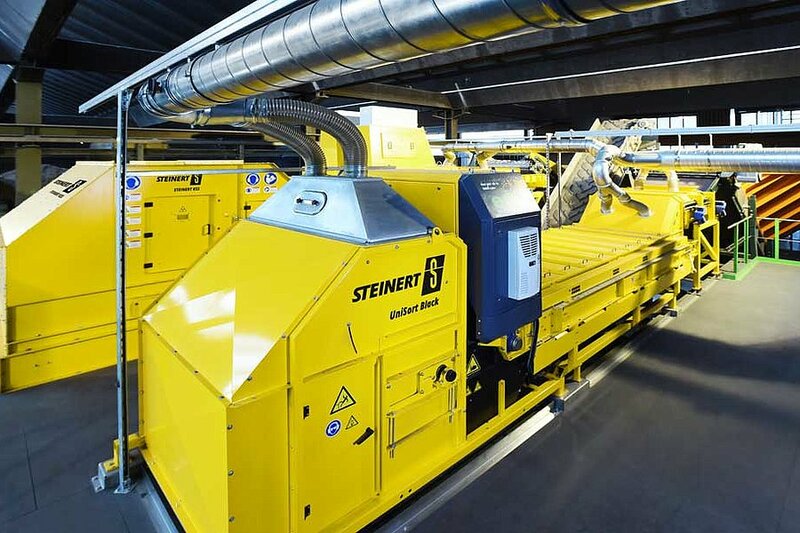 These two STEINERT machines at the end of the Bühlmann processing chain enhance product quality to the level that purchasers need for the sorting of electronic waste and the processing of plastic. This part of the facility can best be described as being flexible and compact. The system’s 11 conveyor belts and reversible discharge belts make it flexible. The machines can run either in parallel or in series in order to perform different sorting tasks. The process is simple and the preset recipes enable it to be used for a variety of products. In this way, Bühlmann is adapting itself to new legislation, new designs for electrical devices and fluctuating stock market prices. Moreover, it enables the company to sort the materials that maximize its profits. In the past, the process was finished once the material was shredded and iron separated from non-ferrous materials. The residual fraction wasn’t processed any further unless this was specifically paid for. This is no longer the case. The drop of the upstream magnetic separators for iron and non-ferrous metals now goes directly to the STEINERT KSS. 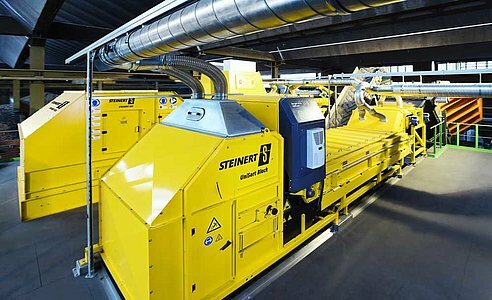 In the first step of the process for the 12–30 mm electronic waste, the multi-sensor sorting system STEINERT KSS produces a circuit-board/cable product. Flame-retarding plastics (including black plastic) are separated during this step as well. 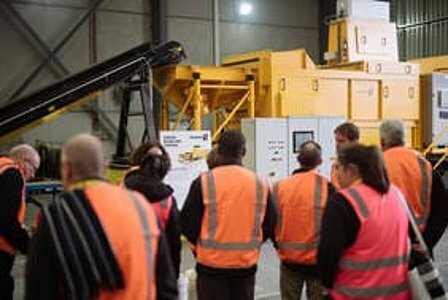 The rest of the sorting step is performed by the UniSort Black, which uses an NIR sensor to detect and sort out visible plastics (ABS, PE, PS, PP). The UniSort Black sorts the remainder to produce a fraction of mixed black plastics that are purchased by the downstream recycling industry. At the same time, the STEINERT KSS sorts the non-ferrous metals out of the separated non-ferrous materials upstream. The X-ray sensor ensures a pure aluminium product and separates heavy metals. Colour sorting is used to separate the heavy metal product into copper, brass and grey metals. In this way, Bühlmann generates up to 7 different products, using only 2 machines. Additional combinations of sensors will be added to the recipes soon for future sorting tasks. In order to increase the depth of the value added, black plastics could also be sorted by polymer class. 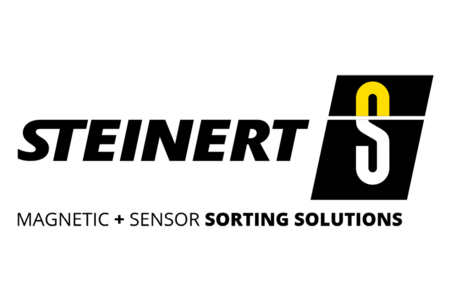 STEINERT also supplies the next solution for this purpose: UniSort BlackEye. 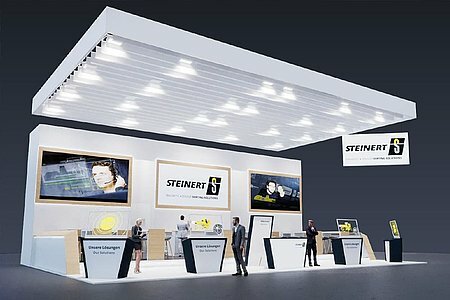 Sorting specialist STEINERT is providing answers to China's import ban at IFAT in Munich – and is presenting a new stand design as well as a new website. 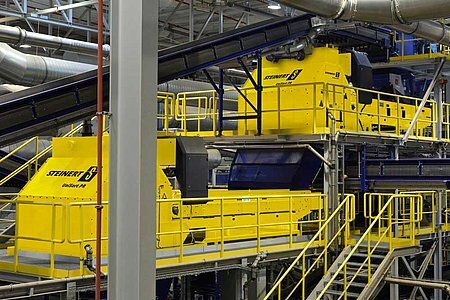 Much more than the sum of their parts: the UniSort Black and UniSort Film NIR sorting systems help meet the now more demanding German Packaging Ordinance, the stricter German Commercial Waste Ordinance and the purity rate of Chinese waste.